reGenerate is a hardware interface between a PC and a Data General computer chassis that gives the PC control of current DG hardware I/O controllers and custom user interfaces. When combined with the reNOVAte and eMV software, applications previously "locked in" to DG hardware can now run on technology. Migration Path. Now Data General Nova, Eclipse and MV users can migrate to modern hardware while retaining existing devices and controllers without loss of function or performance. Systems that could not previously be moved to modern hardware now have a choice! Time Savings. All original user software - applications, operating system and device drivers - are used without modification. No software conversion or rewriting is required. Full features. All DG Programmed I/O and DCH modes are supported - even original features dropped after the Nova 1200 line. Reliability. Off-the-shelf hardware components are used and a comprehensive diagnostic set insures reliable system checkout and operation. Programmed I/O: PIO data transfers, including DIA, DIB, DIC, DOA, DOB, DOC, S, C, and P signals. Interrupt facility: full interrupt handling, including INTR, INTA and MSKO processing and central processor IORST. Data Channel I/O: Standard common DCH data transfers, including read memory, write memory. MV extended DCH: MVextended DCH transfers are also supported, including HSDCH and EXTMAP operations. reGenerate works with our reNOVAte and eMV virtual machine products to provide a complete software and hardware solution. reGenerate enables Data General physical I/O controllers and devices to be connected to the reNOVAte and eMV emulators running on PCs. It supports both Programmed I/O (PIO) and Data Channel (DCH) transfers along with the full DG interrupt system features. 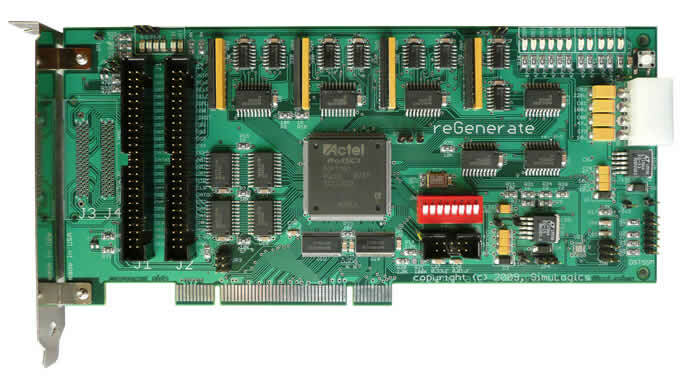 reGenerate consists of a single slot PCI controller that fits within a PC, and a six-foot twisted pair interconnect cable with corresponding paddleboard connector.